City of Melbourne to end double votes for business? While the NSW Governments and the Shooters and Fishers push ahead with legislation to institute the “Melbourne model” of two votes for each business and corporation paying rates and owning property in the city, an independent review of Victorian local government has recommended an end to the very same practice. The independent Local Government Electoral Review Panel, chaired by former federal MP Petro Georgiou, has released two lengthy reports after a year of consultations and discussion papers. The panel’s two reports cover a wide variety of issues, and I will return at a later date to consider the report in full, but the report is particularly interesting in recommending significant changes to voting rights for local council elections. The report is recommending that all permanent residents be given the right to vote in the local council where they live, even if they are not a citizen, and is recommending a significant simplification of the process by which non-residents gain the right to vote. landlord can then choose whether or not to transfer their vote to a tenant. This is inequitable and anachronistic. The information provided was it would mean any landholder who pays rates in the City of Sydney will get a maximum of two votes, regardless of the number of businesses operating in the building they own. Those businesses would not be entitled to vote unless the ratepayer nominates them as one of the two eligible voters. Currently all business owners who pay more than $5,000 a year in rent have the right to vote but are not automatically enrolled. As a result, thousands of business owners who meet the rent threshold and are eligible to vote would lose the right under Mr Borsak’s bill. Giving certain individuals or corporations the power to choose which of their tenants is given the right to vote opens the process up for further abuse. 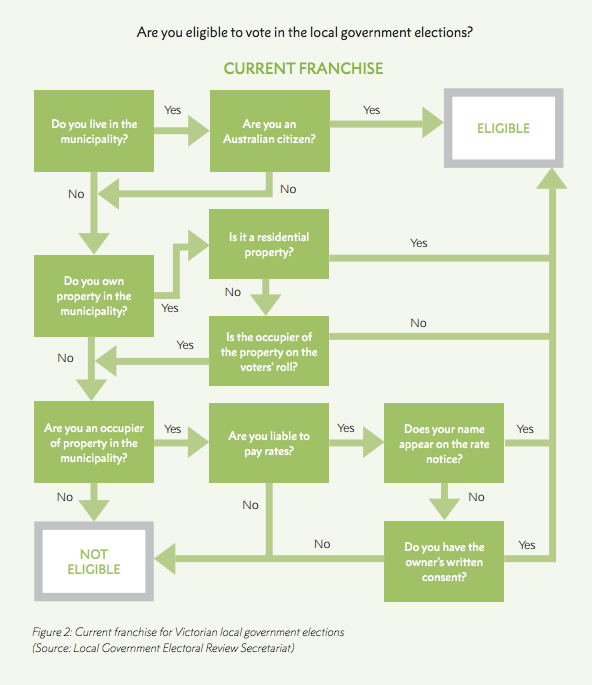 Currently the City of Melbourne is the only council in Victoria where businesses are given two votes, but the process is needlessly complicated across the state, as seen in this diagram produced by the Review’s secretariat (right). The Review’s report has significant implications for the political debate in New South Wales around voting rights for the City of Sydney. The fact that a committee led by a former Liberal MP, and appointed by a Liberal state government, is so sceptical of double voting for businesses should demonstrate the folly of extending the experiment to NSW. If these reforms are implemented, the business vote will be significantly reduced in City of Melbourne elections. At the moment, non-resident voters make up almost 60% of the electoral roll for the City of Melbourne. In addition, the enfranchisement of permanent residents in council elections would be a significant step forward, and I think a positive step towards voting rights being extended to all those who a permanent members of a community, not just those who have achieved citizenship. I was one of the online and email submitters to this review (first report, page 129) and it looks like many of my views were supported by the review and the many views of the Mayor (Cr Amanda Stevens) of my council (Port Phillip) were rejected. I also understand she has been investigated and found in breach of VEC rule concerning leaflets distributed without proper authorisation firstly by the VEC.